A large percentage of passengers now travel with their own entertainment systems — and while tablets and smartphones are ideally suited for in-air viewing, they aren’t necessarily comfortable to use — needing to be rested or awkwardly held by the viewer. Hoping to solve this problem, the TabCaddyClip from Skycast Solutions is a simple device which attaches securely to airline meal trays, providing passengers with a low-cost tablet holder. The clip is adjustable, reusable and very inexpensive. It clamps onto the meal tray and accommodates all sizes of tablet, with or without cases. The device features a hinge which allows the passenger to adjust the angle of their PED to optimize their viewing angle. 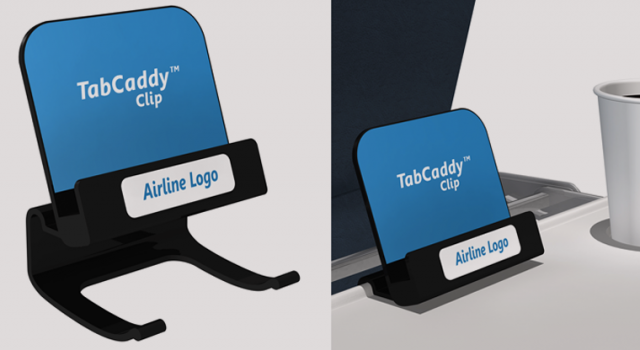 Skycast Solutions envisage the TabCaddyClip being sold inflight for the price of a beer or snack, providing an additional revenue for airlines. The product can also be customized to include branding or advertising. 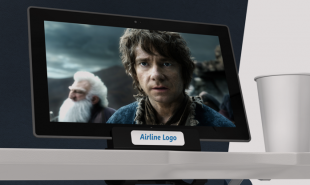 Skycast Solutions offer a range of devices which can help airlines to make the transition from providing inflight entertainment themselves to supporting their passengers’ own devices. Could the airlines adapt their offerings to take advantage of the trend: swapping inbuilt screens for cloud-based entertainment packages?